Keep your internet connection alive. Is there a better alternative to Internet Connection Keeper? Is Internet Connection Keeper really the best app in Internet Utilities category? Will Internet Connection Keeper work good on macOS 10.13.4? 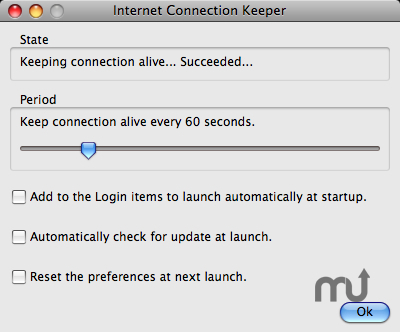 Internet Connection Keeper allows you to keep your Internet connection alive so that your Internet provider does not disconnect you. Internet Connection Keeper needs a rating. Be the first to rate this app and get the discussion started! GateKeeper (which you can configure in the "System Preferences") will refuse to launch it because you've not downloaded it from the Mac App Store (but from our website). In this case, instead of double-clicking on it, all you have to do is to right-click on the Application's icon, and then select the "Open" menu. A message will appear in which you'll be able to confirm that you want to launch the Application (even if it was not downloaded from the Mac App Store from an Identified Developer).